FRUIT JUICY RED: CITRIC ACID, MALTODEXTRIN, ASPARTAME*, NATURAL AND ARTIFICIAL FLAVORS, CONTAINS 2% OR LESS OF THE FOLLOWING: CELLULOSE GUM, SALT, ACESULFAME POTASSIUM, MAGNESIUM OXIDE, RED 40, ARTIFICIAL COLOR, PECTIN, DISODIUM PHOSPHATE, ASCORBIC ACID (VITAMIN C), GUAR GUM, BLUE 1. 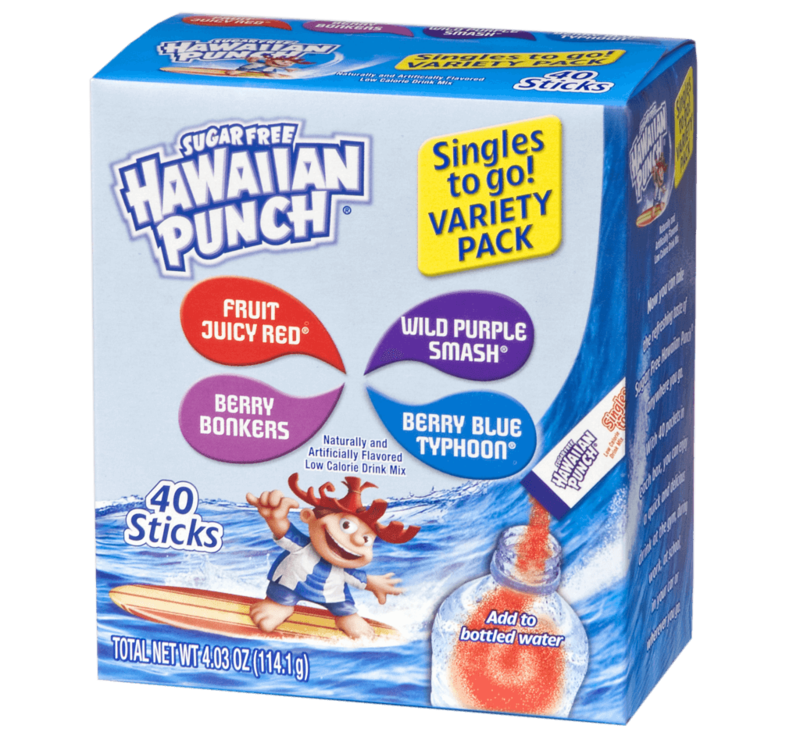 WILD PURPLE SMASH: CITRIC ACID, MALTODEXTRIN, ASPARTAME*, NATURAL AND ARTIFICIAL FLAVORS, CONTAINS 2% OR LESS OF THE FOLLOWING: SALT, ACESULFAME POTASSIUM, ASCORBIC ACID (VITAMIN C), CELLULOSE GUM, PECTIN, GUAR, DISODIUM PHOSPHATE, MAGNESIUM OXIDE, RED 40, BLUE 1. BERRY BONKERS: CITRIC ACID, MALTODEXTRIN, NATURAL AND ARTIFICIAL FLAVORS, ASPARTAME*, CONTAINS 2% OR LESS OF THE FOLLOWING: SALT, ARTIFICIAL COLOR, ACESULFAME POTASSIUM, MAGNESIUM OXIDE, ASCORBIC ACID (VITAMIN C), DISODIUM PHOSPHATE, RED 40, BLUE 1. BERRY BLUE TYPHOON: CITRIC ACID, MALTODEXTRIN, NATURAL AND ARTIFICIAL FLAVORS, ASPARTAME*, POTASSIUM CITRATE, MONOCALCIUM PHOSPHATE, CONTAINS 2% OR LESS OF THE FOLLOWING: ACESULFAME POTASSIUM, ASCORBIC ACID (VITAMIN C), SALT, MAGNESIUM OXIDE, ARTIFICIAL COLOR, RED 40, BLUE 1.